It’s finally November! I just adore November and December and I’ll the fun times with family, friends and food! 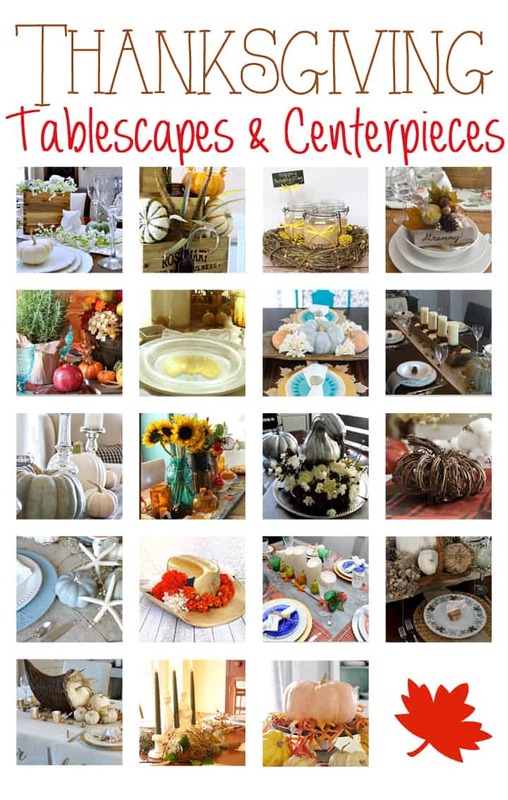 Today I’m joining some great bloggers as we share with you some Thanksgiving Centerpieces and Tablescapes. 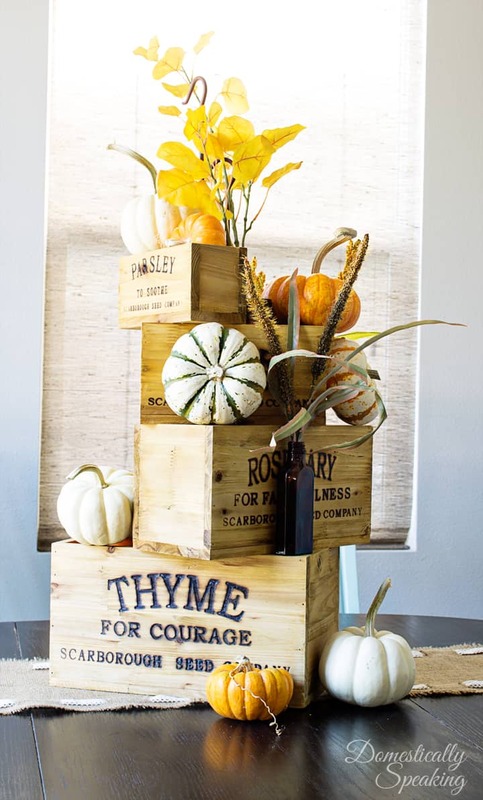 I’ve got an easy Nesting Boxes Thanksgiving Centerpiece idea for you guys! I hope you enjoy checking it out then make sure to check out all the other great ideas from my blogging friends! This is one of those ideas that just popped into my head. 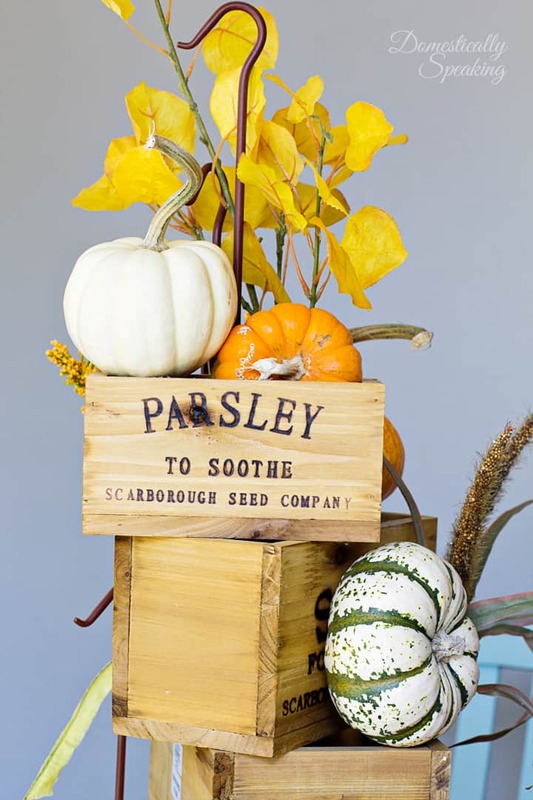 I was trying to plan out what I wanted to do for a Thanksgiving centerpiece when I looked at a couple of my nesting boxes that were hanging on my wall. I grabbed them plus another couple I had in another room and started playing. I started stacking, while gradually turning them – playing with gravity and making sure it all balanced. Then I started to fill it with all the pretties. 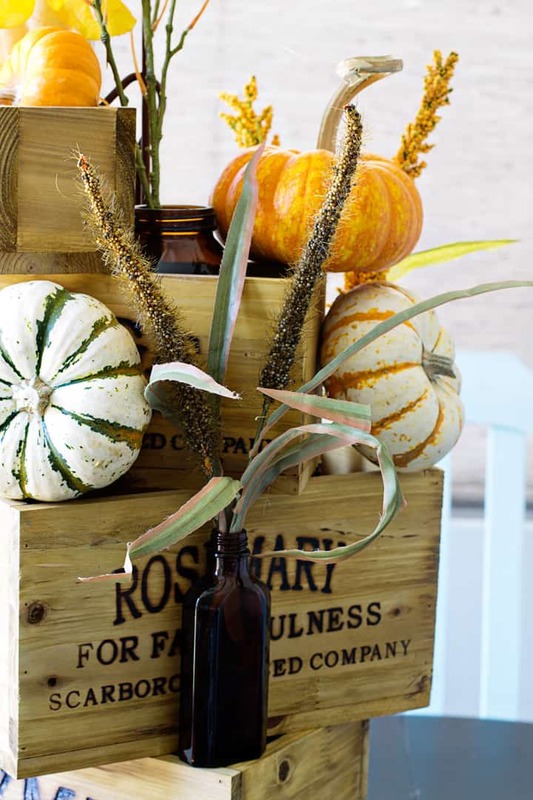 Lots of pumpkins, brown bottles and other fall decor. I love how it came together and it only took a few minutes! 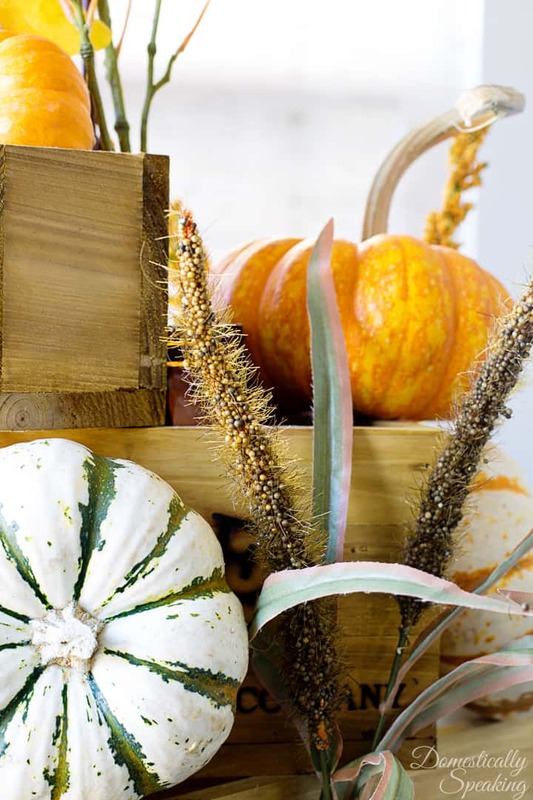 Now check out all these gorgeous Thanksgiving Centerpieces and Tablescapes! Love your unique centerpiece. It has great dimensions and is so eye-catching and natural looking. Congratulations on being featured on LOU LOU GIRLS BLOG HOP. Love this! I can always use more decorating ideas…I always find seasonal decorating a challenge! Great idea, I love the height and versatility! Oh how I love this Maryann! 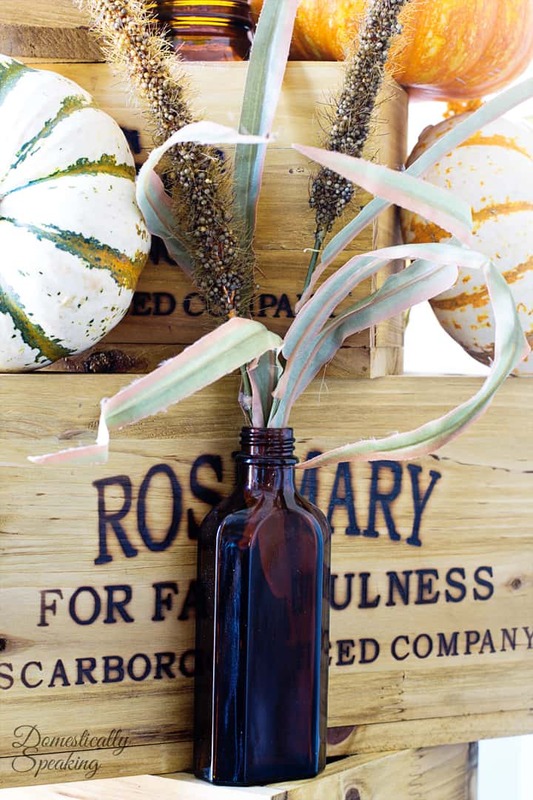 So creative and perfect for fall! Very pretty, Maryann! 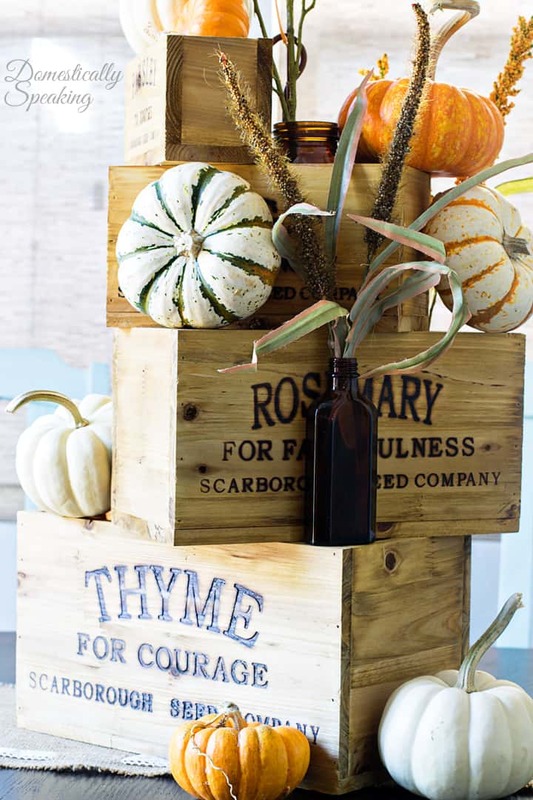 Love those stacked boxes and they look great adorned with pumpkins and fall foliage. So cute!! I love the boxes !! I love your nesting boxes, Maryann. You have created a beautiful centerpiece! Using your nesting boxes and those brown bottles is so clever! They make the perfect stage for your seasonal pretties, Maryann. Enjoy your November and have a happy Thanksgiving! WOW! Now this centerpiece is gorgeous! I love the wood boxes!